Eusing Clock is a small, cute and somewhat useful gadget which resides on your desktop. It is used primarily as an alarm clock and displays the time and date inside of a different design than you might be used to. 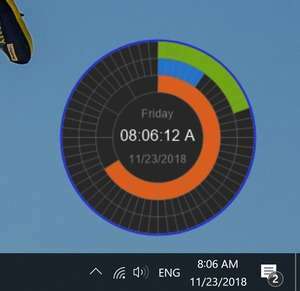 You can use Eusing Clock to monitor different times in different timezones; all you have to do is add multiple widgets to your screen corresponding to the timezone you wish to monitor. Eusing Clock also supports alarms although at the moment, you are required to use WAV files instead of the more common MP3 format which limits flexibility. For security reasons, you should also check out the Eusing Clock download at LO4D.com which includes virus and malware tests. Additional screenshots of this application download may be available, too.